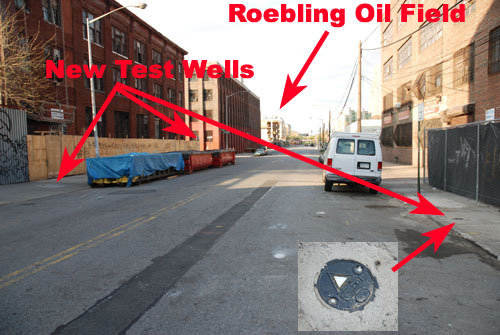 Don't look now, but Roebling Street in Williamsburg has more oil wells. Actually, they are monitoring wells. Several were recently drilled around the Roebling Oil Field months after oil began oozing onto the site of the McCarren Park Mews condo development. Several more have now been placed on N. 10th and N. 9th Streets and on Roebling Street between N. 8th and N. 9th. The drilling took place last week according to a neighborhood resident. While the test wells don't mean that oil is underfoot, they do mean that there is some interest in whether the oil at N. 11th Street and Roebling is only in that area or whether it is more widespread. One of the test well is in front of a development at N. 8th and Roebling on the site of the old Tribeca Oven. Others are around an old industrial building at N. 9th and Roebling that is being renovated as a condo development. Williamsburg activist Phil DePaolo, who has been contacting local officials to investigate the underground oil and its source and is pushing for stepped-up Department of Environmental Conservation monitoring of developments and cleanups, told GL that no reports have been given as yet to City Council Members or to state legislators about any findings about the Roebling Oil Field problem or the source of the oil pollution. 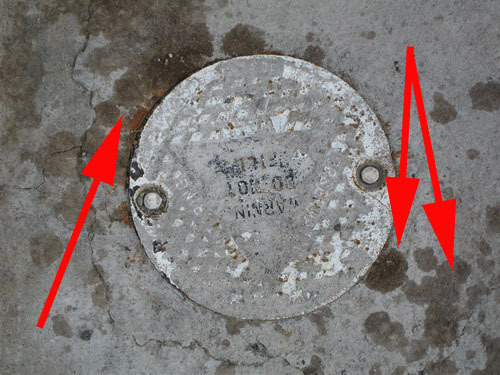 The photo below shows one of the test wells in the sidewalk adjacent to the Roebling Oil Field building and what appear to be oil stains around it. Are thousands of people in Williamsburg dying from the toxic vapors and the poisoned drinking water, or are those lies just reserved for Greenpoint. Hey, where are all those blogs about the toxic Willimsburg nightmare. I guess the Williamsburg bloggers are too busy lying about Greenpoint to work them into their schedules. The truth hurts. do you know anything about why there are fences being put up around the mccarren park track? more and more keep showing up. it doesn't have anything to do with this does it?